Formula 605™ helps regulate sleep patterns. We combine melatonin for its sleep regulating effects with other essential nutrients such as inositol, choline, and lecithin, for optimum mental performance. Choline functions with inositol as a basic part of lecithin and have been shown to offer support for sleeplessness. 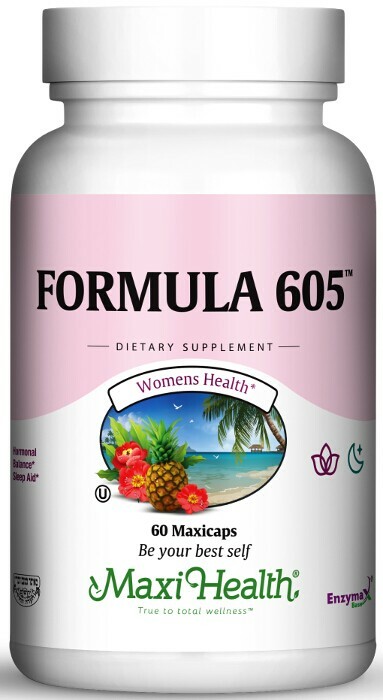 Get the help you need naturally with Formula 605™. Take one (1) or two (2) Maxicaps™ at bedtime, or as directed. Other Ingredients: Vegetable cellulose, vegetable magnesium stearate, Enzymax® (calcium carbonate, bromelain, papain, lipase, amylase, protease, silica) rice flour. The product contains no animal products, wheat, gluten, salt, yeast, milk, artificial flavors, colorings or preservatives. We use Formula 605 when we can't fall asleep. It helps very much. This product is great for nursing clean, I took 2 caps at bedtime & it really helped me. Thx!